When you click the image icon, you will get the Image properties window which consists of Image Info, Link, Upload, and Advanced. How do i disable everything except Image info? Appreciate some help here. I've attached the image above for a clear explanation. I want to remove the 3 tabs highlighted in red. Thanks. You can set them in your Config file. Hi, I would like to disable width and height fields so that users can't resize images. Is there a way to do that? Found way to disable width and height fields from editor\dialog\fck_image.html. Don't know why, but I could't just remove the table where those fields were, but I added "display: none;" into that and it works fine. Your solution display:none doesn't seem to work in IE or Chrome for the drop-down align but it does in FF. I was applying display:none to the individual options in the drop-down and that didn't work. I just commented out the options I didn't want and that did work. 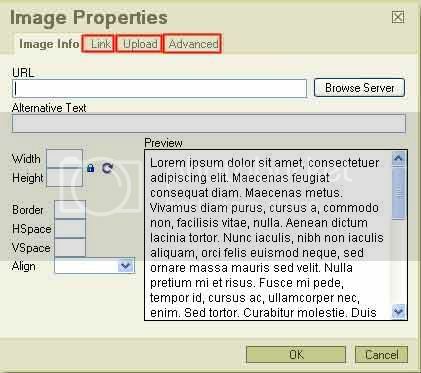 Commenting out the tr's for the Border, HSpace, etc... doesn't work though, the form stops working. The display:none does work for these items though.